I just read the entire sections on Accipters and Red-tailed Hawks. 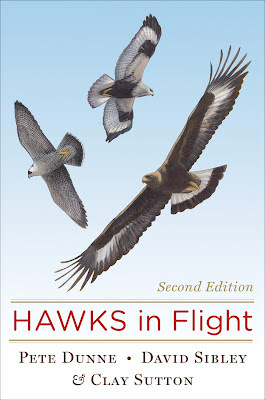 This guide to hawks in flight is awesome! For one, it is very readable. The tone is such that it makes you feel like you're standing there with the authors as they describe the various hawks and falcons. Their golden nuggets of wisdom are shared in a mentor-like manor rather than forcing you to swim up stream against a current of boring stats. All of their combined years of experience, and apparently a ton of consultation with other birds of prey experts, make this the most thorough treatment on the subject. Plus twenty additional years of knowledge and experience between the first edition and this second addition was certainly aided by technological advances in digital photography and improved optics. This is hawk study distilled from the minds and experience of the greatest hawk-watchers. Awesome! This guide takes advantage of illustrations and photographs, so we get the best of both worlds. I appreciate that each photo is accompanied by explanation as well the state/province and month in which the image was made. Each North American species is given its own section within its family chapter. Each selection is really a celebration of each bird. This wonderfully readable guide is a book worth reading cover to cover, then you can use it for future reference. I give HAWKS in Flight one of the strongest recommendations I can possibly give. It is a must-have and must-read for every birder. Congratulations to Pete Dunne, David Sibley, and Clay Sutton and all their expert friends on this amazing accomplishment. List Price: $26, but as low as $14 from online retailers. Buy it here. A review copy of this book was provided to me by HMH. Paint the Birds with Words! How many "Birders" are there? Hummingbirds and Fall Migration Madness plus! Starting a new "Life List"